I have previously written on this blog about a modern cultural phenomena I have noticed, and that is the division of 'jock and nerd'. The problem of the 'jock vs nerd' is basically a re-hashing of the old mind-body problem that pops up in philosophy, historically. One can point the finger at Descartes and his Cartesian dualism as a source of the modern division of mind and body. 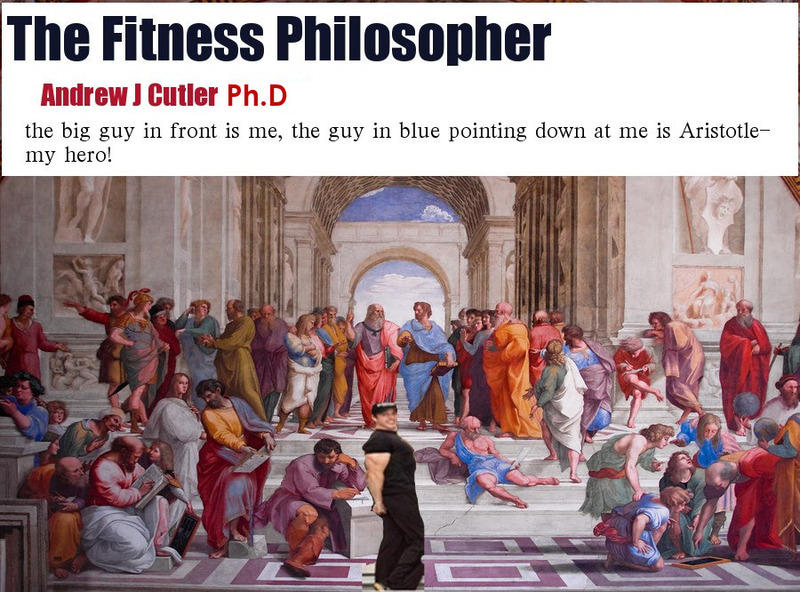 And although modern medicine works on a monist model, popular thought tends to still divide the body and mind as separate and so I wanted to talk about philosophers of history who were concerned with physical fitness and for fun recount what they did to stay fit and keep thinking big! 1. Plato: a true philosopher in the Greek sense of having both the social/political status and the intellectual potential to philosophize 'all day and night.' This is real philosophy in the Greek sense and not limited to our modern understanding of reading philosophy after work or being a professor of philosophy as a job. For Plato, philosophy was a way of life which included physical exercise as a pre-requisite for living well. Plato was a good wrestler, and the name Plato in fact means "broad shouldered' and so we can assume that he was a big and strong man and not just a 'skinny, bearded old man'. In fact, Plato's school 'The Academy' was in fact a gymnasium made up of some gardens, stoas and exercises spaces like wrestling rings. Philosophy was discussed around exercise and music and certainly was not like our stuffy classrooms of today. Walkers: these great thinkers of history all thought walking was awesome. Walking is one of the best forms of aerobic exercise for fat loss and has many of the benefits of tai chi and so I always recommend daily walking of 20-60 minutes. But don;t take my word for it. 2. Aristotle: Plato's best student but not the successor to The Academy. Aristotle set up his own school, again a gymnasium set up outside the city walls. Half way in nature, half way in society the gymnasium was known as the Lyceum or the 'place of the Wolf'. Again the gymnasium was made up of various gardens and exercise spaces and Aristotle was known to 'walk and talk' for his lectures. This led to his specific school of followers to be called the Peripatetics or 'walkers'. 3. Nietzsche: In his book, "Twilight of the Idols" he writes: "All truly great thoughts are conceived by walking." He also writes that a good cup of oil-less cocoa (fat free hot chocolate) after a walk is good for thinking too! It would take the fitness industry another 100 years to start selling post -workout shakes. 5. Adorno: another German philosopher after Nietzsche writes in rather dramatic language, "The body's habituation to walking as normal stems from the good old days. It was the bourgeois form of locomotion: physical demythologization, free of the spell of hieratic pacing, roofless wandering, breathless flight. Human dignity insisted on the right to walk, a rhythm not extorted from the body by command or terror. The walk, the stroll, were private ways of passing time, the heritage of the feudal promenade in the nineteenth century." the difference of newest and previous technologies, it's amazing article.